Trails of History sites that plan to be open on Nov. 11 for Veterans Day are indicated below. The full November program page is available if you want to plan ahead. Nov. 12: Photo Contest Deadline—"all things anthracite" are fair game for this photo contest. To complement an exhibit on photography in the anthracite region, the museum is inviting photographers to submit their photos of life in the area (info and rules on the website). Nov. 11: Veterans Day—site open noon-4 pm. Nov. 4: Fall Lecture—John Moore will present "The Murder of Jack Armstrong" and explore the possible roles of Shikellamy and Conrad Weiser. Free admission; donations greatly appreciated. Site is open noon-4 pm; the lecture is at 2 pm. Nov. 11: Veterans Day—site will be open noon-4 pm, with a remembrance service at 2 pm. Nov. 13: Friends Lecture Series—this is the last lecture for 2018. David Hargrove will present "John Singleton Mosby: The Gray Ghost," exploring the Civil War through the career of this well-known Confederate cavalry commander (more info on the website). Lectures are held in Freeman Hall Auditorium at the Cornwall Manor Retirement Community, across the road from the furnace site (map and directions). Lecture is free, donations are accepted. 7 pm. Nov. 3: Boone Birthday Program—celebrate Daniel Boone's birthday and learn about his family. Birthday program starts at 1 pm, with cake and ice cream to follow. Included in regular admission. Nov. 11: Veterans Day—site is open noon-4 pm, and Paul Trainor will present "Soldiers in the French and Indian War" at 2 pm. Suggested donation of $2 per person for talk. Regular admission applies to visit the historic area. Nov. 8: Tickets for Christmas at the Cloister—as of today, the general public can purchase tickets ($6 per person) for this limited-seating event (scheduled for Dec. 10 and 11). Details are on the website. Nov. 11: Veterans Day—site will be open noon-5 pm. Ephrata Cloister will be closed on Monday, Nov. 12. Please visit the Fort Pitt Museum website for information on schedules and programs. 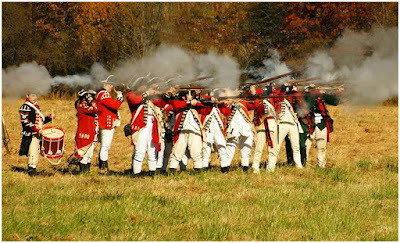 Nov. 3: Whitemarsh Encampment Reenactment—this long-standing event commemorates the Nov. 2-Dec. 11, 1777, encampment of Gen. George Washington and the Continental Army in the Whitemarsh Hills. Reenactors dressed in authentic American and British uniforms will march to the beat of fife and drum and demonstrate the military tactics used during Revolutionary War. Skirmishes on the grounds are scheduled for 11:30 am & 2:30 pm. After the skirmish, come visit a troop encampment where women in colonial dress cook over an open fire and children play colonial games. Other events occurring during the day include blacksmith and beer brewing demonstrations, a Lecture & book signing by Mary Stockwell, author of Unlikely General: "Mad" Anthony Wayne and the Battle for America, children’s activities including a Children's Muster Drill and scavenger hunt, experiments of Dr. Benjamin Franklin (presented by Michael Kochan), and Open Hearth Cooking Demonstrations. The Hope Lodge mansion will be open for tours. Sutlers, bake sale, and food will be available for purchase.Program details. Admission charged: $10 (age 18-59), $5 (age 6-17 & 65+), "family" rate is $25 (1 car with 2 adults and up to 4 children). Free for Friends of Hope Lodge members and children age 5 and under. 10 am-4 pm. Nov. 4: Heritage Day—costumed interpreters will be stationed in the house as you tour, Dr. Priestley will demonstrate chemical principles, and there will be games for children. Admission is free. 1-4 pm (chemistry demos at 1:30 and 2:30). Nov. 1: Hands-On History—step back in time to learn about life as a farm child. Details and registration info (including link for online ticket purchase). Cost is $11 per person; free for LVA members and children age 5 and younger. 9 am-3 pm. Nov. 3, 10, 11: Fall Workshops Continue—check the website for course descriptions and registration info. Nov. 11: Veterans Day—site open noon-5 pm. Nov. 10: Wine-Making with Mazzotta Winery—stay tuned to the website for updates on this program. 10 am-1 pm. Nov. 10: World War I Lecture—local historian Scot Buffington will use original clothing and accoutrements to discuss soldier life during World War I (more info on website). This lecture is in conjunction with the current exhibit, “Do your Bit!”: World War I in Ambridge, which closes December 23rd. 3-4:30 pm. Nov. 14: Behind-the-Scenes Tour—this is a chance to visit artifact storage areas not generally open to the public. Light refreshments and non-alcoholic beverages will follow (BYOB if you like). Cost is $20, $16 for members. Space is limited, and reservations are required (details on website). Tour starts promptly at 6 pm. Nov. 15: Lecture—researcher and writer Jeffrey Snedden, author of the weekly Beaver County Times column "Histories and Mysteries," will be the speaker. Program is free and open to the public. 7-8:30 pm. Nov. 4: American Revolution Roundtable Lecture—Lt. Colonel Sean Sculley will present "West Point and the American Revolution: The Great Chain and Her Fortification." 2-3 pm. Nov. 11: Veterans Day—the museum is open noon-5 pm. Admission is free for veterans and their families. Nov. 11: Friends’ Lecture Series—Robert Franks will present "Welcome Home, Bro," based on his experiences as an Airborne Infantry Platoon Leader with the First Cavalry Division, serving in Vietnam in 1966 and 1967 (details on the website). 2-3 pm. Nov. 3-4: Trains & Troops—this annual program salutes our armed forces and explores the role of the military in railroad history (and vice versa). A Swing Dance Saturday night (separate or combo ticket) lets you enjoy big band music, refreshments, and swing, swing, swing. Program details. Sat., 9 am-5 pm; Sun., noon-5 pm. Nov. 11: Veterans Day—the museum is open noon-5 pm. Please visit the Planetarium page for a full schedule of shows. Nov. 2: StoryTime—this month's story is Every Autumn Comes the Bear by Jim Arnosky. The program will take place in Mammal Hall; meet near the black bear diorama. Included in regular admission. 10-11 am. Nov. 8: Mapping Pennsylvania—explore various maps of Pennsylvania, including one so big you can walk on it (in your socks). This Nature Lab program is designed for visitors age 7 and up. Included in regular admission. 11:30 am. Nov. 11: Veterans Day—museum open. At 11 am, the museum's Liberty Bell replica (outdoors on the North St. side) will be rung as part of the Bells of Peace initiative, marking the centennial of the World War I armistice. At noon, the museum will open a new exhibit, Dressed for Service: Pennsylvanians in the Great War, featuring uniforms from World War I.
Nov. 15: Racing Ramps!—this "Curiosity Kids" program will explore historic road surfaces and test which one makes for the fastest travel. Meet in the Transportation and Industry Gallery (details on the museum website). Included in regular admission, but space is limited so be sure to sign up when you purchase your tickets. 11:30 am. Nov. 15-16: Holiday Marketplace—shop the Trails of History with representatives from The State Museum of PA, Landis Valley Village and Farm Museum, Ephrata Cloister, Somerset Historical Center, and Daniel Boone Homestead (details). Museum admission will be free for shoppers. Hours on Thursday are 10 am-3 pm. Friday opens at 10 am and runs until 7:30 pm for 3rd in the Burg. Please visit the Washington Crossing website for details on this month's schedule and programs.